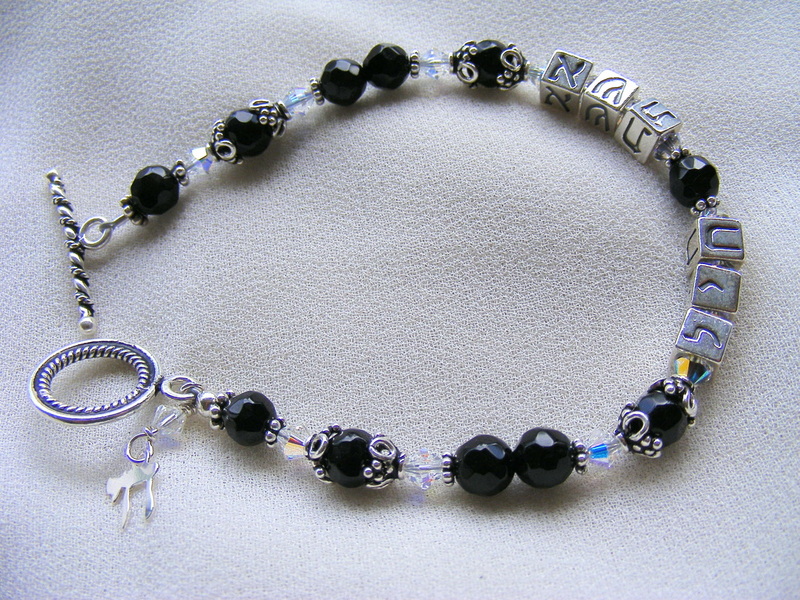 Your name, or your loved one's name is spelled here in solid sterling silver Hebrew letters on this your choice of Gemstone, sterling silver and swarovski crystal bracelet. Bali silver brings out the gemstone colors beautifully. A dainty star of David charm adorns the sturdy toggle clasp. Or choose a "Chai" or heart. I have a wide variety of gemstones including garnets, pearls, lapis, amethyst, moss agate, african jade, carnelian, onyx and more... Price here includes 5 letters. Each additional letter is $2.50. Choose your length: standard 7.5" long or if you need a different size, please let me know. Please specify the name or word you would like in the comments as you check out. I LOVE to do custom work, because I know how nice it is to find exactly what you are looking for. That's the reason I started making jewelry in the first place. So if you have a particular gemstone, color or style that you are looking for, email me at christine@thelumbrosos.com I also make Wedding sets for the Bride and Bridesmaids. Great for teens! Especially the guys! If you have an allergy to metals, this leather lace will be comfortable on your skin. Surrounded by pewter beads, this necklace is a good conversation starter, as you wear a part of the Torah close to your heart. The charm itself is about one inch long. Measures 21 inches long, If you need a different length, just let me know..
Another winner for teens, this pewter star of David hangs between pewter accent beads. The star is about a half inch in length and the necklace itself is 21 inches long. If you would like a different length, please let me know and I can adjust it for you. 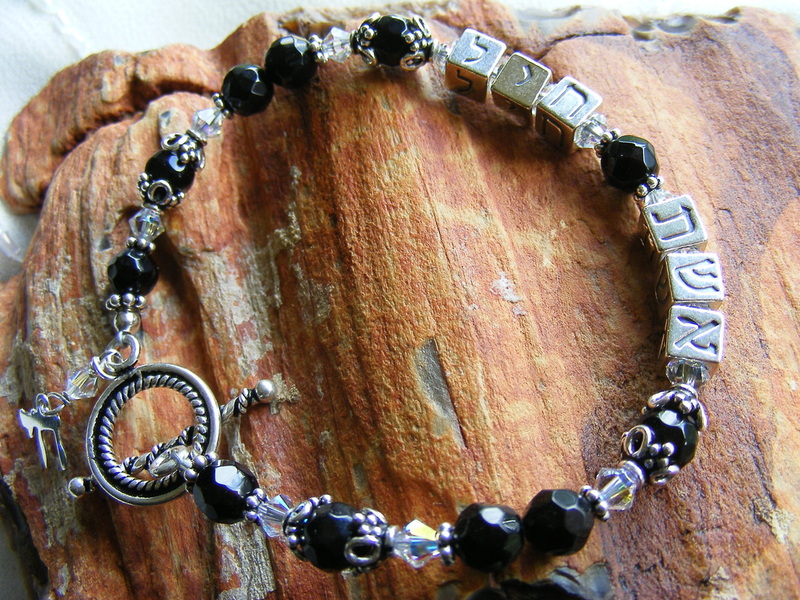 Pewter Torah Scrolls dangle beneath a shiny iridescent glass bead. These earrings are about 1.5 inches long and the ear wires are sterling silver plated surgical steel. This beautiful glass mezuzah with sterling silver ends carries with in it a Hebrew scroll with verses in Hebrew of Deuteronomy 6:4-9 and 11:13-21). Measures 1.5 inch from the tip of the bail to the bottom. Comes without a chain, but I do have sterling silver chains available on request for $12. each. 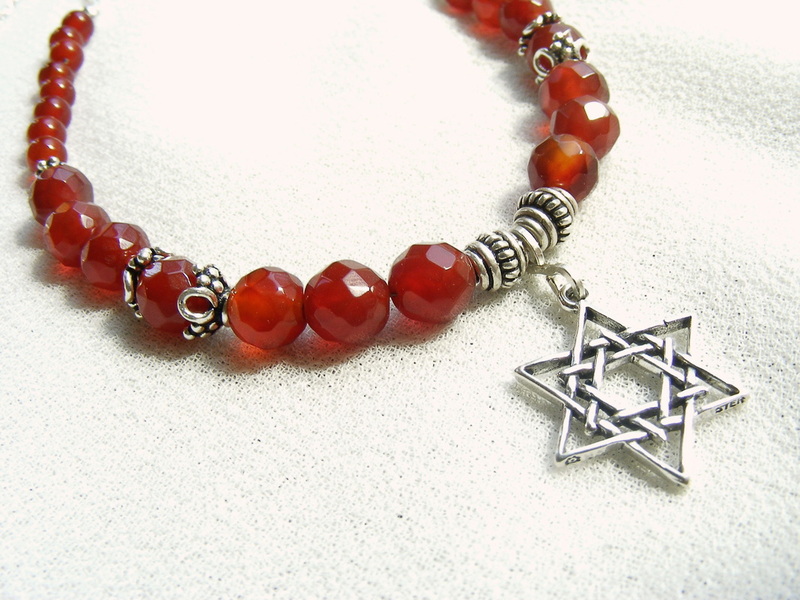 This Magen David charm is made in Israel of sterling silver. The charm is 3/4 inches from the tip of the bail to the bottom of the star. The lightweight sterling silver chain is 18 inches long. This is for the charm only. Sterling silver chain is available for $12.00 more. Just ask. 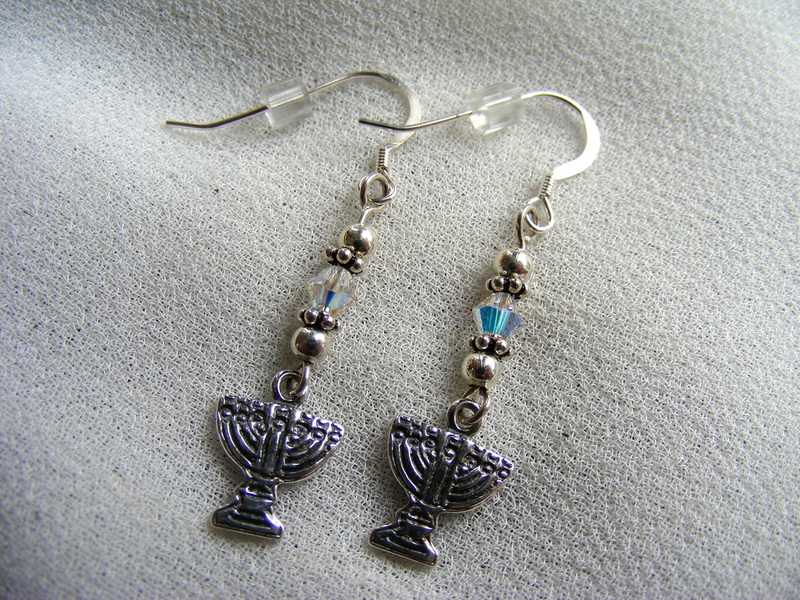 Cute menorahs dangle beneath silver and swarovski crystal beads. Approximately 1 1/4 inches long. 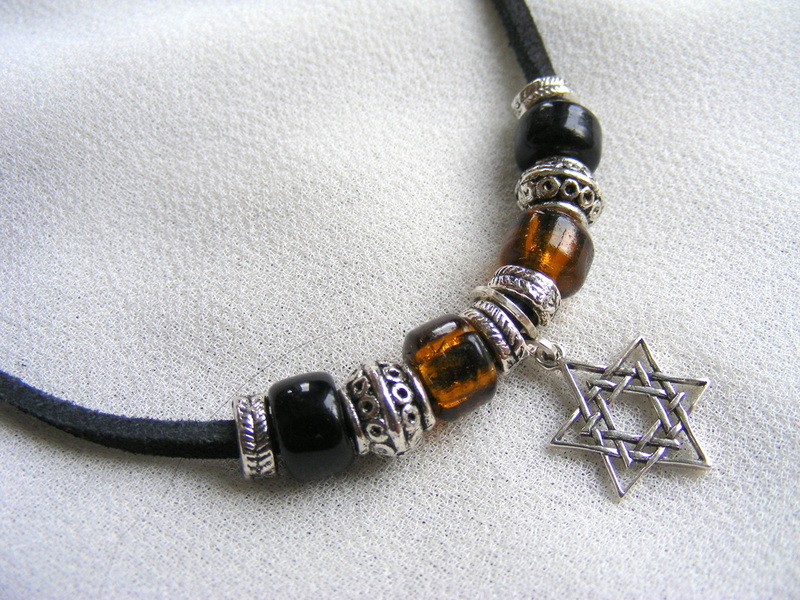 A sterling silver fillagree Star of David hangs from a glass and pewter beaded suede leather lace. It is finished with a hand crafted sterling silver wire clasp. Especially nice for men and teens. Cute Pewter Stars of David dangle from a sterling silver plated surgical steel earwire. These are about 3/4 inch long and can be ordered in nearly any color. Please specify your choice of color in the box: deep blue, light blue, bright pink, light pink, amber, emerald or peridot green, garnet or ruby red, clear, amethyst purple, or yellow. 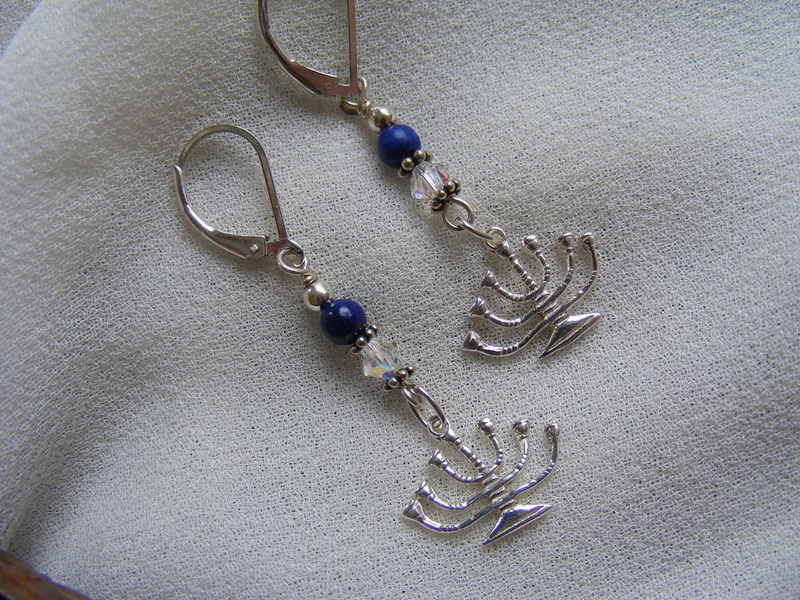 Dainty menorahs dangle beneath silver, genuine lapis gemstones, and swarovski crystal beads. Approximately 2 inches long. Fitted with secure sterling silver leverback earwires to prevent loss. This is a rich and elegant genuine Carnelian gemstone necklace that shimmers with a golden light. An ornate double Sterling silver Star of David is the focal point. These gemstones are embellished with Bali silver. This necklace is 18 inches long, finished with a figure 8 sterling silver chain, lobster clasp and a 1.5 inch extender. This sterling silver star of David charm is set with an irridescent created opal in the center. Made in Israel, this charm is about 3/4 inch from the bail to the bottom tip of the star. Very beautiful. Sold without the chain. Sterling silver chains are available on request. 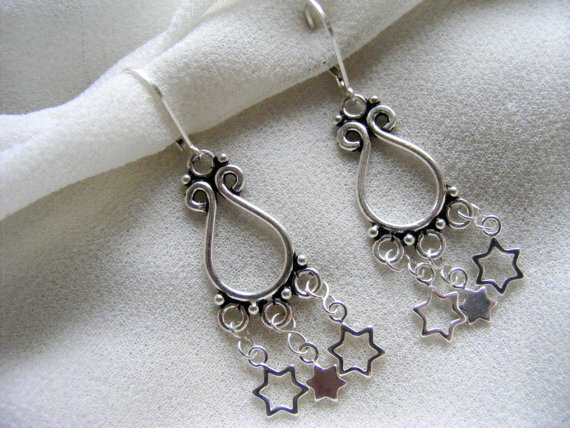 Delicate stars of David swing fluidly from these beautiful solid silver chandelier earrings. They dangle one and three-quarter inches below the sterling silver secure lever back ear wires. All components from the secure leverback ear wires to the chain links are sterling silver. Sterling Silver is a good investment, and beautiful too! Quality earrings that are classic, fun and feminine! Approx. 1.5 " long from the bottom of the ear wire. This original art depicts the month of Tishrei during which we find Yom Kippur and Succoth. The illustration shows the two goats: the one within the camp, and the "scape goat" that is symbolic of taking our sins into the wilderness. Comes in its own cellophane pocket. Send a special greeting to those you love and spread the light of Hannukah this season. This special card says, "This Year At Hanukkah... " and inside reads: "May these Hanukkah lights bring you light and freedome" "Be Strong, be strong, and be strengthened"
This bracelet bears the Hebrew letters which spell out "Eschet Chayil" which means "Woman of Valor" - a wonderful and meaningful gift for the woman that you would like to honor. It is also a reminder to us of the kind of woman we should all strive to be: women of valor. Genuine faceted black onyx stones give warmth and richness against the sterling silver, while the clear Swarovski crystals give an aurora borealis rainbow sparkle. Closes with a secure toggle. 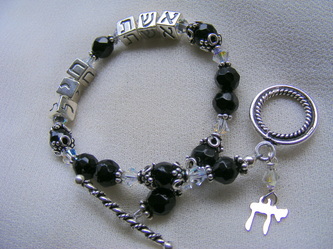 A dainty sterling silver "Chai" (Hebrew for Life) dangles from the clasp. Comes with a warranty. Sterling silver is now an investment as the price of silver and gold continue to skyrocket. Market prices will effect the price of this bracelet. 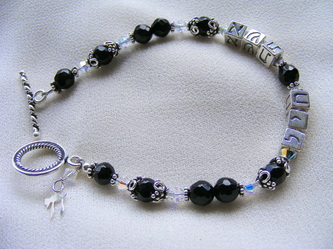 This bracelet can also be made with different stones and colors, or your choice of name or word. Just let me know what you would like. Here's a very beautiful fillagree Star of David focal piece suspended among Bali style sterling silver beads and blue Swarovski crystals. Just enough sparkle to be feminine while the sterling silver gives it a classic look. The sterling silver chain adds length up to 18 inches and a 1.5 inch extension so you can adjust the length. These gleaming handcut garnets have a deep and warm pomegranate color and are off set with small Swarovski crystals for a touch of sparkle. The focal piece is a sterling silver Torah Scroll with a Star of David. The 18 inch necklace is finished with sterling silver chain and a 1.5 inch extension for adaptability. This is a print of my original watercolor depicting Pesach (Passover) in the month of Nissan. Represented here are the barley, the wine, the light of the menorah and of course the sacrificial lamb, fullfilled by Yeshua. Print is ready to frame. Actual print is 8" X 10" and has an extra small white border. Also available as a greeting card. This is a print of my original watercolor depicting the month of Adar and Purim. Represented here is the Torah Scroll, the wine signifying the joy of this festival, and the crown that was Esther's. Print is ready to frame. Actual print is 8" X 10" and has an extra small white border. This is a print of my original watercolor depicting the month of Shvat at the time of the New Year for Trees. Here you can see the seven fruits that signify this event: wheat, barley, grapes, figs, pomegranates, olives and dates.